This past weekend was a busy one here. Saturday morning the DH and I were up and off at 6 am for a Duathlon in which I was sponsored by my company. The race was a kayak or paddle board for 500 meters and 5 km run. Well I was not too excited about the running part of the race. 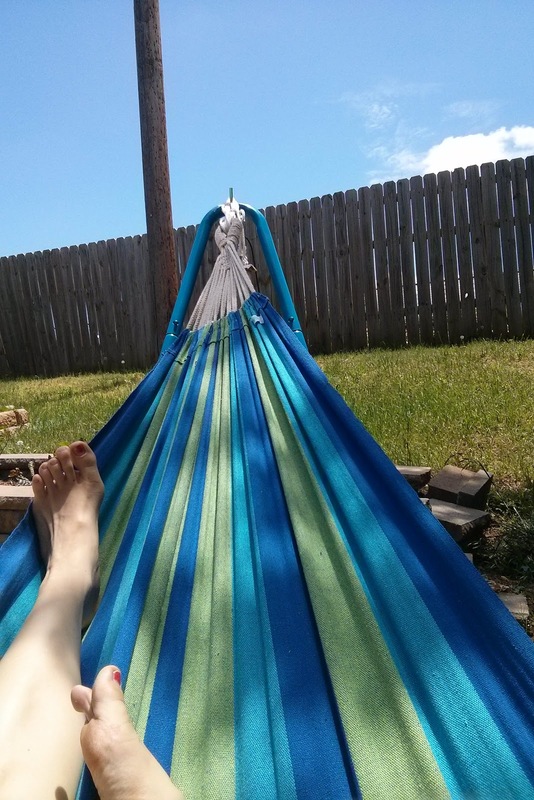 The weekend before I had jumped off a planter in our backyard spraining my ankle. After only a week of rest and no activity I was about to run a 5k. Well we arrived at the Riversport Challenge complex and I got my packet. I was in Wave 4 of 11. As wave 3 was finished I was starting to get slightly nervous in my life jacket. Luckily there wasn't much time to think as we were being shepherded into our kayaks. The next thing I know the staff is handing me a paddle and saying, "you might need this" and I was in the water. I paddled as far away from others as I could so I wouldn't get caught up in the congestion as participants in others waves had done. I figured out after getting situated I needed to flip my paddles over so they would scoop the water. Oops! I waited as patiently as possible for the horn and then we were off. The water leg went smoothly after that and I was fourth back to the dock. My split for the kayaking was 4:03. Then I went right into the run. Boy my arms were tired and I almost feel getting back onto the dock. I was fine except getting smeared with goose poop. The first 1k was not the best but also not the greatest. Since I was in wave 4 it was starting to get very hot by the time I started my run. I started walking after 1k because I was both tired and my left hip was cramping! 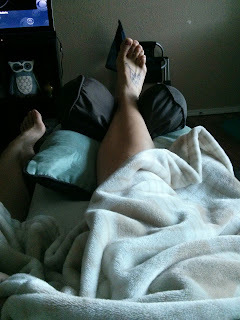 I must have over compensated during the week and my hip was not happy to be working so hard again. The rest of the 5k was run/walk style. The other racers were very nice and supportive. I finished the run in 39:59. Not my best time but for having a sore ankle and not training I will take it. 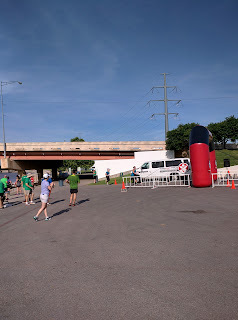 Overall I finished in 44:01. I can't wait until next year and this time I will train. Brief Summary: Dave Ramsey, the author and narrator, conveys the morals and values he has used to run a successful business and how you can and should employ these to have your own successful company. Long Review: Entreleadership authored and read by Dave Ramsey is a great introductory book for those who already are familiar with the Ramsey philosophy and have interest in starting their own business. I listened to the audio book on my commute to and from work, giving me the book in short installments. I appreciated only catching a few themes at a time as this allowed me more time to absorb the lessons and corresponding stories. I would not recommend listening to this book in long stretches as Mr. Ramsey's voice can become annoying. While most of the principles are about generally being a good person I found the fact religion was brought into the subject as unnecessary. In the book it wasn't stated that Ramsey would discriminate based on a potential employee's religion. The book gave me the impression religion would be taken into account in his hiring process and is a practice I would not appreciate if I were a potential employee. My 29th birthday has come and gone but I thought I would fill you in on the gifts I received. First up my Mom sent me the gifts shown below. The purple tree is amethyst. I have always wanted one of these and it goes great in my bathroom with my owl. The second gift was Aquamarine and Muscovite from Schinua, China. 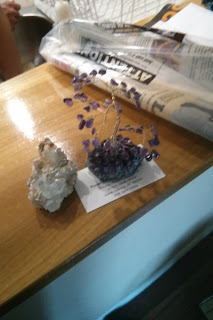 My mom picked up these great finds at the Cleveland Gem and Mineral show. The next gift was from my husband. I had been debating about getting a new fit bit for a while. I really am interested in monitoring my heart rate since I get cold a lot. 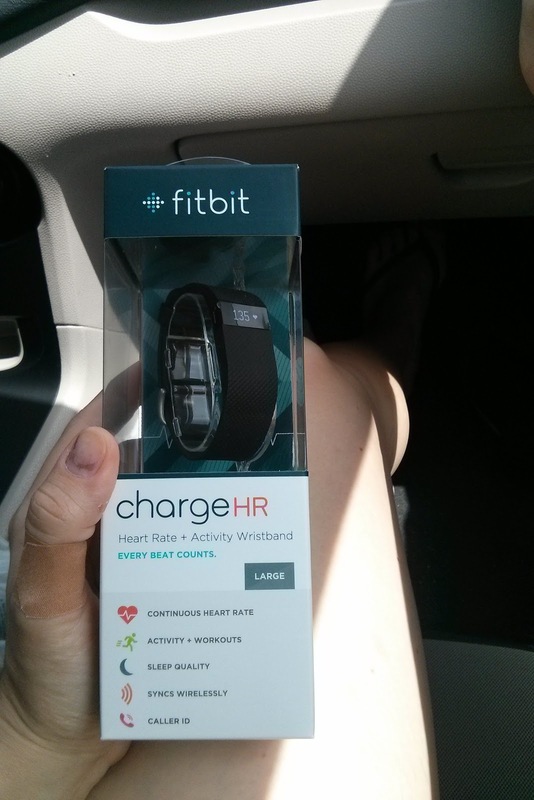 He was very thoughtful and bought me a fit bit charge HR. I haven;t gotten to use it but will be reviewing it soon. I also want to thank my Mom, Mom-in-law, and sister for the very nice cards from their families. Thanks also to all those wishing me a happy birthday on facebook. Onward to another year of mischief, mayhem, and wonders. Today is my 29th birthday!! I am looking forward to dinner tonight as my super husband is making me lamb. I have decided to get back into blogging and will be writing about topics which spark my interest. Expect to see more on home improvements, books I am reading and reviewing, restaurants we are enjoying and hobbies. I look forward to moving into the last year of my 2o's with you! Now for a picture of what I wish I would be doing tom. instead of going to meetings.